Tackle this cancer once and for all when you support the cause with this football jersey. 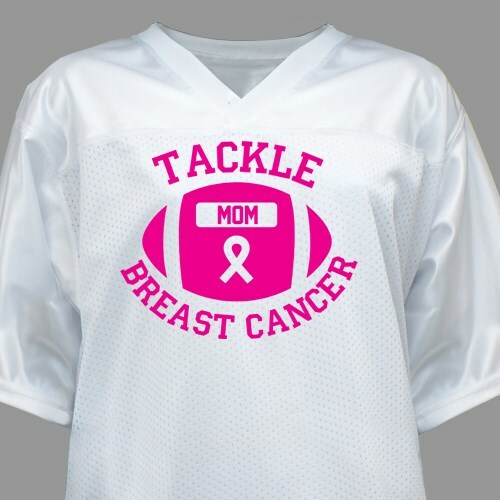 This breast cancer awareness jersey is ideal for football games or awareness events in your area. This jersey is 3.4 oz., 100% polyester tricot mesh with 100% polyester dazzle fabric yoke and sleeves, a 1 x 1 rib-knit modified v-neck collar with front and back yoke, set-in sleeves, double-needle stitched sleeves and bottom. Machine washable and available in adult sizes S-2XL. Free personalization of any name is included. Very pleased. It fits well, and I get lots of compliments on it. Today’s Price: $35.99 In Stock!